I hope everyone enjoyed their pre-release weekend. I certainly did - I choose Simic for my guild and ended up being able to make both it and an Orzhov deck. Although I opened a Hydroid Krasis , I didn't manage to open any Aeromunculus or Sharktocrab . 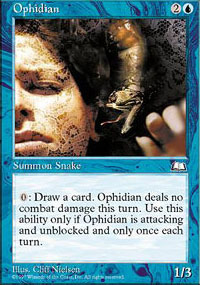 Still, I liked the Simic deck better than the Orzhov and, although I ended up a modest 2-2, I enjoyed the games. That leads me on to the topic of this week's article: my hot takes from the early days of the format. I have been jamming both sealed deck and drafts on both Magic Online and Arena, and have some early thoughts on the format and the cards in the set. Seriously, was is this card a rare? 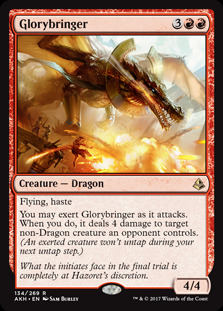 If you remember Glorybringer you'll know what I mean by the title of this hot take: this is the card you want to open, and the card you desperately hope your opponent doesn't have. I've played against this card too many times already, and the text of it should just read "When you play this card, you win the game". That's how good it is. The problem isn't just with how good the card is, though. At rare, it means you are going to see this card a fair bit if you play enough. It's the card you are going to get sick of very quickly. It's the card that makes you not want to play a format after you have lost to it for the nth time. At mythic rare, it still would have been powerful, but not as oppressive as it is going to be. Let's examine how the card plays. You play out your creatures, and your opponent does the same. 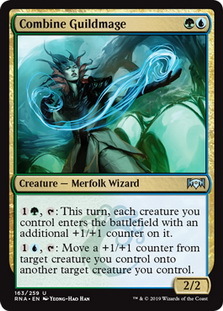 Your opponent, though, gets value from their creatures due to Afterlife being in the two colours of this card. Most likely, you have played out some 2/2s and 3/3s and maybe something a little bigger. If you are in Orzhov as well, you probably have some 1/1 Spirits floating around. Your opponent, on the other hand, has played out some creatures and has some Spirits. Then they slam this card down. 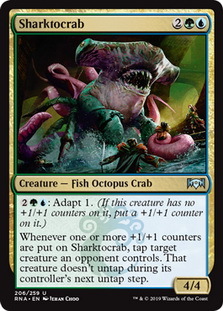 Suddenly, you have 1/1s and 2/2s instead of bigger creatures, and they have 3/3s and 4/4s as well as some 2/2 flyers. 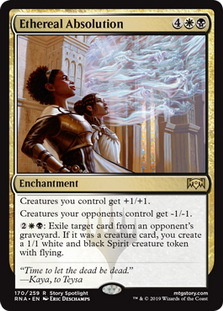 If you were playing as Orzhov as well, you lose all your Spirits and, if you have Afterlife creatures with 1 toughness, you lose them AND the Spirits they create. Suddenly you are a long way behind on board. You start chump blocking to stay alive, and your opponent untaps and starts eating your creatures from out of the graveyard to create even more threats. It's a situation you just can't come back from unless you can deal with the card. Ethereal Absolution is the strongest card in the set, and it is a rare. That is a mistake by Wizards. 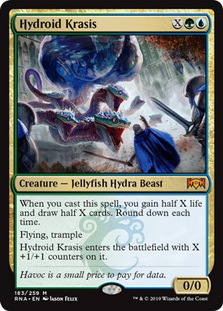 I'm happy to admit that this card wasn't even really on my radar before the pre-release. It just didn't seem like much to me. Then I drafted an Azorius deck with 7 Guildgates and 2 copies of Gateway Sneak and I changed my mind. 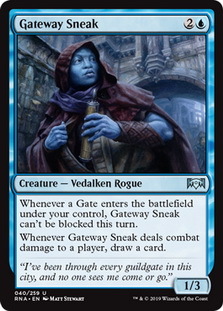 In one of my games in my draft, I had both copies of Gateway Sneak on the battlefield and managed to play 3 Guildgates in a row, drawing 6 cards off of them. I won the game (though I actually almost decked myself) and I decided right then that I loved this card. I want you to have a good read of the card above. Seems pretty good, right? Now, have a think about the guild mechanics for the green guilds in this set, Riot and Adapt. What do they have in common? If you said +1/+1 counters, you are a winner! This card is extremely good. In fact, at the pre-release, we were referring to it as Overrun . 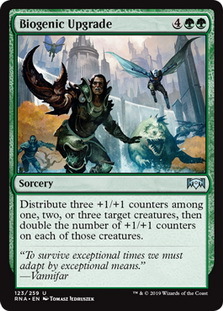 Combined with the trample creatures in Gruul - or Trollbred Guardian - or with the flying creatures in Simic - or Skatewing Spy - this card just ends games. In fact, I had one game where I had Zegana, Utopian Speaker out, used its Adapt ability end of turn, untapped and played Biogenic Upgrade on it to create an 18/18 trampler and swung for lethal. On other occasions, I was able to spread the counters out among my Adapted creatures in the right way so that if my opponent was able to remove one of them, I would still win. My only advice for this card is to not play it into open mana if you suspect a removal spell. That way lies disaster. Time will tell on this particular hot take but I think all of the guilds seem pretty well balanced. Rakdos is probably the weakest of them; I haven't played with it yet, but have played against it, and the decks I faced just didn't seem that good. 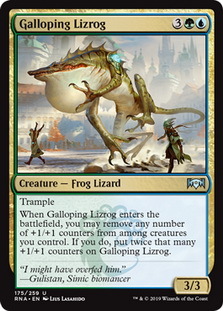 Simic has been the most fun for me, so far; the shenanigans you can do with +1/+1 counters, Galloping Lizrog s, Combine Guildmage s and splashed Bolrac-Clan Crusher s is quite enjoyable, and being able to attack with the threat of Adapting your creatures makes it very awkward for your opponent to play around. 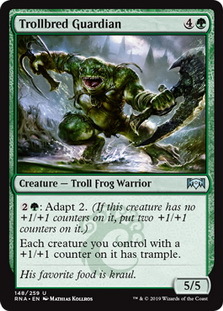 Gruul is scary to face as its creatures come at you hard, fast and big, but it's not unbeatable even with slower decks like Azorius. In fact, I won a draft with an Azorius deck, beating two Gruul decks along the way. Azorius is slow and controlling but as long as it survives the early game (and it can) it has an inevitability about it. All in all, though, I think the guilds are reasonably balanced against each other. 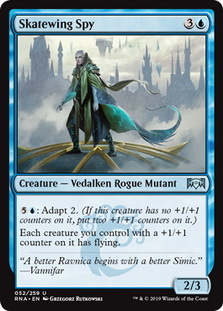 What do you think about Ravnica Allegiance? Do you have any hot takes of your own? Let me know in the comments below.